The Raksha Bandhan, also known as Rakshabandhan is an annual event or rite organized and performed by the Indians. The festival is centered on the tying of a talisman, thread, or amulet as a form of protection. The objects are tied on the wrists by the people celebrating. You can send rakhi to India from many different parts of the world for the celebration. 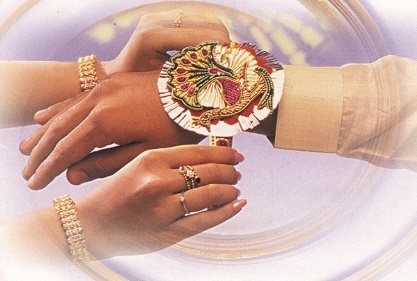 The protection during Raksha Bandhan is majorly offered to the brothers by their sisters. It can also be offered to patrons by priests and also to potential or real benefactors by different individuals. This year’s Raksha Bandhan will be on the 26th of August and as usual, people from different parts of India will be travelling to celebrate the festival. Annually, the event is observed on the final day of the Hindu lunar calendar month of Shraavana. The Hindu lunar calendar month of Shraavana normally falls on August that is the reason this event is celebrated on August annually. On 2017, it was celebrated on the 7th of August. However, Nepal had a slight change in the day of their celebrations and it fell on the 28th of July 2017. The festival gives special regards to married women and it is based on the practice of exogamy. Exogamy is a kind of social arrangement where people are only permitted to marry outside a social group. In some cases, parents are not allowed to visit the brides on their marital homes according to the custom. In some rural parts of India where this practice of exogamy is highly prevalent, the brides have to travel to their places of birth for the celebration. It is a very interesting ceremony that thousands of Indians look forward to being part of yearly. Another significant thing that happens during this period is a voluntary kin relationship. It is a process where people that are not biologically related voluntarily pledge to become each other’s sisters through the tying of the Rakhi. According to the meaning of the word Rakhi, the both promise to protect each other as if they were born of the same mothers. Rabindra Nath Tagore arranged a festival for the Raksha Bandhan celebration in order to strengthen and tighten the bond of togetherness and love among Muslims and Hindus of Bengal, and also urged them to protest in unison against the British Empire. He then utilized the Raksha Bandhan in spreading the brotherhood feeling among the Bengals. The festival celebrates the bond between siblings and the sisters are made to tie threads around the wrist of their brothers. This symbolizes love and also motivates the brothers to fight and protect their sisters. While the devotee or brother promises to take care of the sister, the priest or sister at the same time wish for the protection of the brother and also show their love to them. Apart from protection, the word Raksha can also mean preservation and care. While the Bandhan means tying together. This is to show you how the name came to existence.